Behind the car, feet clear of the puddled shards of glass. Watch their asses. Watch your skin; when the gas gets on it, keep your fingers clear of your eyes. Don’t rub. Protect the membranes inside your nose. Use your shirt, your forearm. Use the person beside you. Shield each other, cover each other with coverage. Charge your phone; share your footage. Watch your foot; it may be run over. Apparently, here in Ferguson, when a cop runs over your foot, it gives him the right to kill you, to leave you, to keep his name hidden from public knowledge for his own protection. Apparently, if a friend survives you, no officers will bother to hear his detailed, dispiriting and harrowing story. Bare your palms. 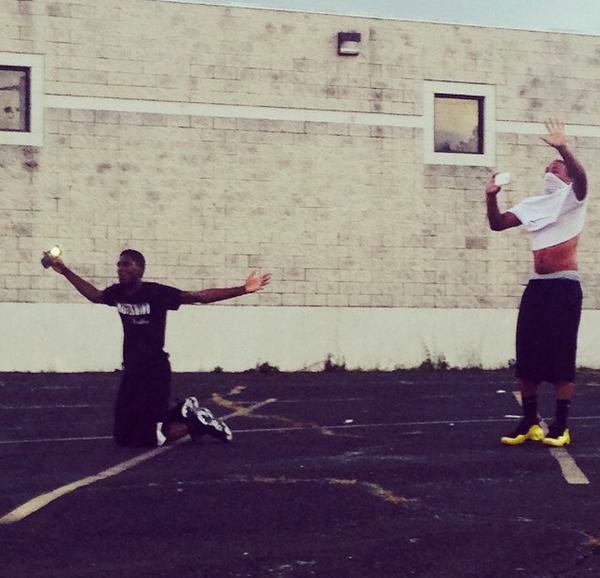 Every few minutes, raise them high, cry don’t shoot! I don’t know if it matters. I don’t know if it’s getting to them, one way or the other. Is it pricking their consciences or making their trigger fingers itch? I don’t suppose it matters. Maybe nothing matters except you and what’s left to preserve. And what’s left? Can you tell us? What is left? They are shooting rubber and wood at you every night. They are swinging clubs and riding through near-empty streets on tanks, ordering you back to the barracks you used to call homes. But they’re circling you, too, wearing masks and spitting slurs. They are blocking the bridge and barring your entry. They are shooting at you in your yards. I imagine you asking, Is anyone watching? Is this real or The Rapture? 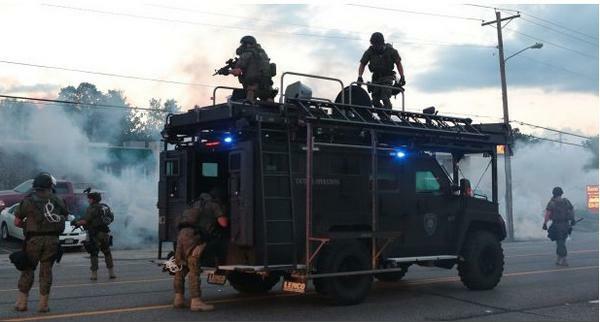 Does it feel like the end of the world to anyone outside of Ferguson? Does it seem to anyone else like a leaving-behind? I imagine you asking, If home isn’t safe and the streets are lined with bowed knees and shed blood, where is acceptable shelter? Where should we aim our feet and go? Stay here. Do whatever you can. Duck. Chant. Sob. Rail. But stay. The rest of us are running to and fro in your stead, spreading your words, your footage, your fears, your demands for a demilitarized, diverse police department. We are trying to make the world around you understand how wrong it is for police from multiple counties to bring in heavy artillery on ground and heavy surveillance in sky, in order to subdue the few of you brave enough to venture out each night in search of answers. We are trying to help you hold your county accountable for employing and protecting an officer who would flee down the same street where he opened fire on an unarmed boy and left him there, first to die, then to bleed in open view for several hours. You will never do as much damage to the town’s businesses as the damage being done to the town’s bodies. Do not try. If there will ever be a way to win, this sort of competition isn’t it. On foot, you cannot play chicken with tanks. 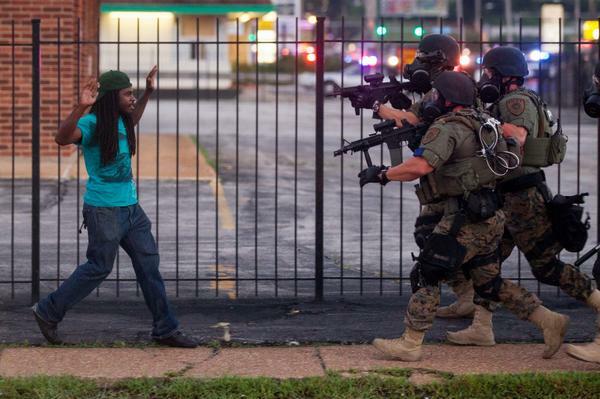 Unarmed, you cannot play roulette with rifle-bearing riot police. The truest catharsis is in the coming together, though it is tempting to torch everything around you that feels like an emblem of inequity. Everything around you seems an emblem of inequity. And we know. You may feel like it’s all closing in. It is. You may feel like facts are taking too long to find. They are. You are right. You are right. But we want you to live, to prevail, to tell us the tales the nation has been sluggish in reporting. We need you to show the world the Ferguson that is, so that we can try, at least, to help you configure a more equitable version in the years to come. We cannot promise you anything more than our presence, our viral sharing, our amateur abilities to re-publish all that you report to us in real-time. But these small, collective gestures have worth — and we want you to be able to watch that worth appreciate over time. Stay here: behind the car, right along the police line, chests to the shields. Do not run with your backs to them. We are here with you, we are watching, and with the clarity our safe, observational distance provides, we can say with certainty that you will need to wait. Yes, even longer than all these inequitable, unjust years. Stay here with us, yet longer, and wait. But do not do so silently. And rest assured: you do not wait alone.